Is it hot enough for you? In the long term, it's bound to get hotter with global warming. In the short term, you probably just want to cool off, NOW, and chili pepper ice cream may be just the substance you need. 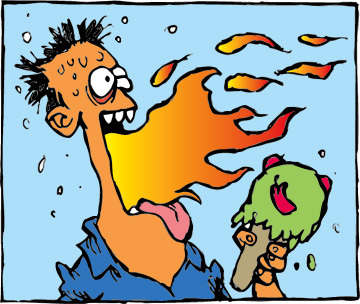 The peppers are hot, but the capsaicin in them has a cooling effect that intensifies the ice cream's chill factor. It's just the sort of thing that could make a culinary adventurer's head spin. Start with a $7.50 sampler of housemade ice creams -- a mild lemongrass-chili pepper ice cream plus two other flavors of your choice -- at Spices, the Southeast Asian restaurant at 2671 S. King St. Graduate to two scoops of lemongrass-chili pepper ice cream alone for $4.95. Call 949-2679. A hotter vanilla version is served up, at $4.95 per bowl, at Sam Choy's Breakfast, Lunch and Crab. Call 545-7979. If you must have more, head to the source, Tropilicious, at 206 Mokauea St., for 1-1/2 gallons of the stuff. They're open from 8 a.m. to 4 p.m. Mondays to Fridays. Call ahead to make sure batches are available, 847-1750. Shows by local celebrities top my list of picks for the weekend. The ever-popular Joe Moore is back on stage this weekend and next with his newly written Western drama, "Unlikely Lawman," at the Mamiya Theatre from Thursday to Saturday (see Page 4). Also happening this weekend, Kalapana is in concert at the Pipeline Cafe on Sunday at 7 (see Page 25). This show is a first for "the Pipe" because the show is being presented in a sit-down cocktail format with table service. It looks like a day in Chinatown for me on Saturday. First I want to check out the Second Saturday festivities. There's the summer cinema series at NextDoor, psychic reading at Louis Pohl Gallery, art off the wall tours at the Hawaii State Art Museum, sidewalk sales along Nuuanu Avenue and Bethel Street, and all the galleries to visit. The event goes from 11 a.m. to 4 p.m.
And since I'll already have parking in town, I'll meet some friends for dinner before heading over to the rRed Elephant at 7:30 p.m. to catch John Cruz, Johnny Helm and the Soapbox Symphony. Advance tickets are $17.50. At-the-door tickets jump to $22.50, so if you're gonna go, buy early. Tickets are available by calling 550-8457 or online at honoluluboxoffice.com. No service fees apply.